Done With SimCity? Check Out This Very Different Alternative. Shining Rock Software is a one-man studio currently working on a game called Banished—a city-building strategy title that promises to show us the wild, rough world of frontier colonization. In Banished, your objective is to help a group of exiled travelers establish a sustainable colony. What sustainable means here is that basically every action is a balancing act, and going off too far in one direction has consequences. If your people hunt or fish too fast for the wildlife to replenish, the animals may go extinct, leading to starvation. Nomads can join your town to increase the workforce, but if you let too many of them in, you risk introducing new diseases to your population. The game is centered around the townspeople, who can possess any of the eighteen professions Banished has, from mining and blacksmithing to fishing and hunting. They can have children, grow old, and eventually die. Furthermore, each map will look different, and will contain different amounts resources, making each playthrough and each town unique. 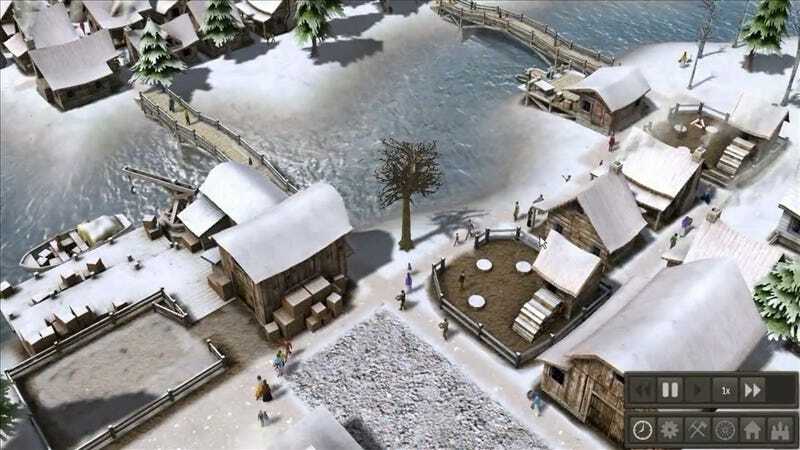 Banished is currently in development, and is slated to be released for the PC sometime in 2013. Color me very interested.